Get the look that gets you noticed! Great headshots are the calling card that can get you noticed in the acting and modeling world. A solid portfolio that shows the range of your expressions and styles can help you stand out in a sea of faces. 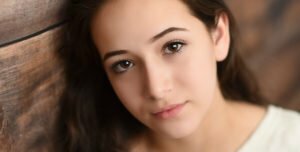 Having a photographer with experience in acting and modeling photography is vital to ensure you get the unique look that puts you on top of their list. At kp studios, we’ve helped actors and models of all ages with their portfolios, including the talented young actors with Acting Out Academy. Our in-house stylist and make-up artist knows how to help you get the look you’re going for, and we know how to capture it. We have a variety of pricing options available to suit your needs – from a single look to a range of looks complete with wardrobe changes. We also provide slate shots – short (3-5 sec) videos that capture a glimpse of child in real life. This is a must if you plan to be on Actor’s Access. Get the image that gets you noticed. Contact kp studios today to schedule your session today. Take advantage of special pricing for a limited time during our Summer Acting Portfolio Session! Save $150 on a professionally styled photo shoot on June 10th, 2017. Time slots are limited, so book your session today!